With so many different WordPress developers out there, it can sometimes be hard to identify the best ones. While they all have their pros and cons, some developers are clearly better than many of their competitors. WPZOOM is one of those developers. 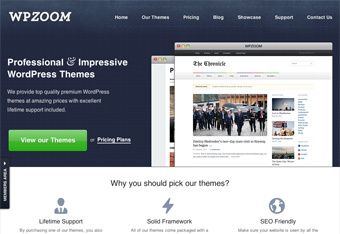 WPZOOM, or WP ZOOM as it’s sometimes called, is a professional WordPress theme developer founded in 2009. WPZOOM is committed to designing and developing high quality, professional WordPress themes for business people and bloggers alike. At WPZOOM you will find a variety of restaurant templates for WordPress, blog templates for WordPress, and much more! In fact, you will find themes and templates for just about any niche at WPZOOM. WPZOOM is a relatively small company, with just 7 employees. However, they took their time in selecting these employees, ensuring they were getting the best of the best. When building a new theme, their team pays special attention to the visual appearance of the theme, while still maintaining their great coding standards. The result is a beautiful theme with excellent functionality. All the restaurant templates for WordPress, and every other theme that WPZOOM sells, also comes with lifetime support. So if you run into a problem with the theme or template, even a few years down the road, you can contact WPZOOM for help. Also, all of their themes are SEO optimized, which helps you get ranked in the Google search results. Even though WPZOOM is a fairly small company, they provide many business owners with the tools they need to build websites, and ultimately, to succeed. Regardless of what type of website you are trying to build, you will find what you’re looking for at WPZOOM. Plus, their lifetime support guarantee should help give you the confidence to take the plunge and start establishing a web presence for your business!